I have to admit that the title makes me a bit uneasy, but at least the teaser trailer looks pretty good. I had to share this one. It is pretty damn awesome. A tiny light in the dark? I stumbled upon this post by Tracy Hickman from February. Now, as any good fanboy I went down the rabbit hole and started imagining what new Dragonlance project had been green lit by the Dragon Highlords in Seattle. It is of course wishful thinking, as there have been no signs whatsoever of a resurrected Dragonlance since the line was discontinued back 2007. However, if we allow ourselves to dream a little, one might have a preference as to what will be released. A lot of people on Facebook talk about a live action movie or TV show like Lord of the Rings or Game of Thrones. It would make a lot of sense given the success of these franchises and the profits that can be found in those media. Personally, I would prefer books and game material as that would move the setting forward instead of rehashing stories we have all read and re-read a hundred times. Not to mention the risk of releasing something that will alienate the original fan base due to questionable creative choices, much like what happened with Star Wars: The Last Jedi. Besides, I think it is time to move the story forward, especially considering where we left the world of Krynn. It seems to me that they had fixed the issues that the 5th Age created and had a pretty good baseline for new stories independent of the characters and story lines we are familiar with. I am not holding my breath here, but I do return to that Facebook post from time to time. It has been over a year since I archived the blog vowing to never blog again. To be honest, blogging seemed a little stupid, given the rise of Twitter, Facebook and their ilk, and I didn’t really feel like I had anything worth saying. Now, I still don’t think I have anything worth saying really, but having had an overload of various media streams, I came to the realization that I had become nothing more than a brain dead consumer of anger inducing posts by people I didn’t really want to engage with. So, the first step was to limit my Facebook usage to an absolute minimum. I have unfollowed a whole bunch of people and removed as much personal information as possible. Step two is to perform the same pogrom on my Twitter feed, and let me tell you, I am doing great. Third, I want to create content instead of consuming it all of the time. Nobody will read this blog, but that is not the point either. I want to reverse the tide, so my poor brain can get back to work in a proper manner instead of chasing the next shot of dopamine from the all too well-know “pull to refresh” movement. And since I am playing 5th edition with a bunch of like minded individuals I might actually have something to write about in the future. Even though I recently renewed my domain, I have decided to archive this blog. I have moved all the posts to WordPress.com and I will not be renewing this domain again. Given the rise of the various social media platforms, it seems like blogging is dying and since I have little to say anymore, I think it is finally time to retire my rants for good. 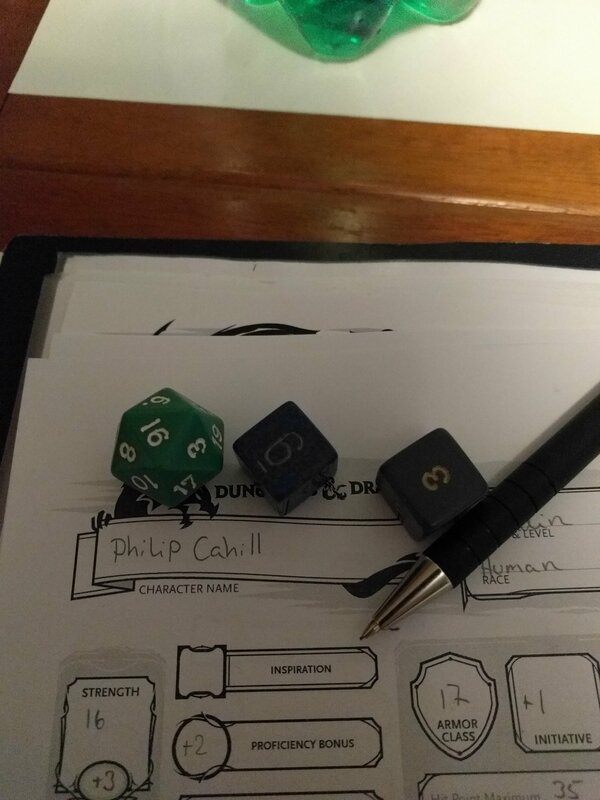 D&D is almost like cigarettes, only without the cancer of course. I was able to quit smoking some years back, but for some reason the whole D&D spiel still lingers. Of course, it helps that I am now part of a gaming group that meet regularly and it pretty much in sync. One of the newer players took over DM duties and he has been able to really breathe some life into it again. Besides, the group is down two members, which appears to be perfect. Not only do we view the game in a more coherent way now, but it is also much easier to find a date for some serious gaming. We play in the Forgotten Realms, and even though it might not be my favorite setting I like it quite a bit. The really nice thing is that I don’t know it as well as some of the other settings meaning that I feel like I am exploring something new. Furthermore I play a palading, which I never really done that much in the past. I have always had an unhealthy wizard fetisch, but I find the character class less importnat now than I have done in the past. We have also started a G+ community, which works really well for us. G+ is somewhat nicer than Facebook and not full of weird ads and racist comments. We communicate there and share links and other cool stuff. I can see there a lot of gamers that use it and I can highly recommend it. We have also switched from 3.5 to 5.0, which makes characer generation a lot simplier. There are definitely things I miss about 3.5, prestige classes for instance, but it seems like a fair trade off when you consider how fast you start gaming.